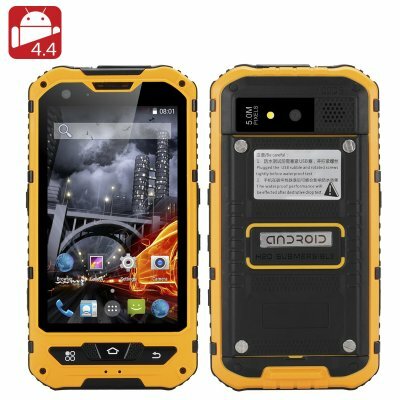 Successfully Added 4 Inch Waterproof Rugged Smartphone - Android 4.4, Quad Core CPU, IP67, 1GB RAM + 8GB ROM, Dual SIM (Yellow) to your Shopping Cart. Explore the world with the smartphone made for the outdoors. The 4 inch Android rugged smartphone comes with IP67 waterproof rating, dual SIM card support and a solid build. Your fancy iPhone 6 Plus may come with loads of features and double as a status symbol. But that won’t do you much good if you venture into the big outdoors for a camping trip, where instead of the comfort of a Starbucks coffee shop, you get to experience all the power of the elements: rain, dust, sand and lots and lots of potential gadget damage. The 4 inch rugged smartphone would make a great secondary phone and bring you all the functionality you need in a compact and tough exterior. Featuring IP67 waterproof rating, it is completely dust tight and be submerged in water for up to 1 meter. With 8GB of internal memory and 32GB externally, you will have plenty of storage space for your apps and media. Plus, you can always swing by the Play Store for more fun stuff. With 3G connectivity and a simultaneous support of two SIM cards, you will always stay in touch. You will also have a powerful LED flashlight to guide you to safety in the dark. The 4 Inch Waterproof Rugged Smartphone comes with a 12 months warranty, brought to you by the leader in electronic devices as well as wholesale Android Phones..